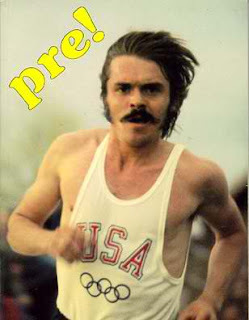 Steve Prefontaine weighed 145 lbs and tried to maintain that weight while training and during down time when his weight could creep to 150 lbs. Many of the big time runners of the 20th century were carefree about their eating habits and diets. New runners today seem to have to much information and they start to fall apart with anxiety when they try to prepare for races. Now there are gels, gu, electrolytes, compression gear, fancy shoes, sports socks all the things we try to explain simply on this blog to get to the roots of running. Many people are told to carb up and the reality is that you are just getting fatter before a race and possibly making it harder on yourself since your gut will be full of crap literally. Not everything on this list was a constant. Pre did die in a car wreck while intoxicated but he was not drinking out of control all the time. Pre was very social and would sip a beer while hugging and roaming the room around saying Hi to everyone he knew. That was a misfortunate accident with a lot of gray area about the details. My point is that his diet was pretty simple when you look at the list. No sports drinks no Protein shakes no supplements he just ate what was available and did great. Sometimes we give ourselves reasons why its okay to fail or tell ourselves why we won't succeed at a given moment because we don't have all the tools we have been using like if you don't have your energy gel for the race. The truth is we give all those things power when all the strength you need is within you. Yes supplements help, but so did holding a feather in a trunk so DUMBO could fly. Eat clean, light, food from nature and you will run as strong as possible.